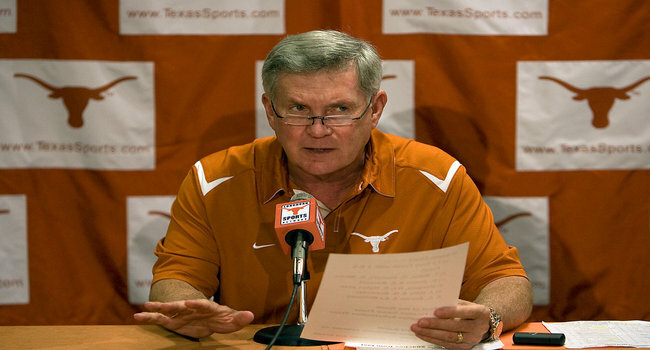 Could a blowout loss to rival Oklahoma send Mack Brown packing? I pulled even on the season with a big 4-0 week highlighted by several blowouts. Big conference match-ups highlight my selections this week. The favorites all look pretty good. Oklahoma (-13) vs Texas – There have been blowouts in this series in the past but this is the first time in a long time where the spread is this large. Texas needed a lucky break to defeat Iowa State 31-30 in Ames last week while the Sooners won a hard-fought game over TCU by the score of 20-17. Blake Bell is now entrenched as the QB in Norman and rightfully so. His ability to run and pass with equal success has been key to the Sooners being unbeaten. Texas will again be without David Ash who still has lingering concussion issues. The Horns are 1-3-1 against the spread in their last five meetings with Oklahoma while the Sooners are 9-4 straight up in their last 13 against Texas. I think Texas will keep this closer than many think but Bob Stoops won’t pass on a chance to put Mack Brown out of his misery. Take the Sooners to cover. I expect Johnny Manziel to have another big day this time against Ole Miss. Texas A&M (-4) at Ole Miss – The Rebels are happy to be home after three straight road games the last two of which they lost. Waiting for them will be Johnny Manziel and the Aggies of Texas A&M. This has the makings of yet another high scoring SEC game. Neither defense is very good as they both give up over 25 points per game. The Aggies are 3-2 in their last five against the spread while the Rebs are 2-3. I really like A&M to cover in this game behind a huge game from Manziel. Northwestern at Wisconsin (-10) – This is the type of game where we will find out just how good Northwestern really is. In the past, the Wildcats would lay an egg following such a tough loss and the oddsmakers know it. That’s how we get the ten-point favorite in Wisconsin. The other factor is that Wisconsin rushes for over 300 yards per game. The Wildcats were run over by Ohio State on the ground last week so the Badgers will look to do the same. Northwestern will press the Badgers defensively with a nice belnd of run and pass but they must take care of the ball. Turnovers doomed them in their loss to the Buckeyes last weekend. NU is 1-4 in their last five against the spread when playing at Camp-Randall Stadium while the Badgers are 4-1 straight up when the Wildcats come to Madison. When you factor in Wisconsin coming off a bye and the Wildcats losing the biggest game in decades at home, this game is ripe for a big Badgers’ win. I like them to cover. Indiana at Michigan State (-7) – The Hoosiers make the first of two straight trips to the Great Lake State by heading to East Lansing first. Both Indiana and MSU are coming off big wins, especially IU who defeated Penn State in what was seen by many as the biggest win in Bloomington in decades. Sparty finally saw its’ offense get going in a major road victory over Iowa. Now these two teams meet in Spartan Stadium with a chance to move to 2-0 in their respective divisions. The game is a clear match-up between the nation’s 10th ranked passing attack of Indiana versus the nation’s seventh-best scoring defense in Michigan State. Sparty is 8-1 in their last nine games when playing the Hoosiers and they were taken to the brink last season. Indiana is 3-11 against the spread in their last 14 games against MSU. I see this game boiling down to the offense of Michigan State leaning on the defense of IU which gives up over 31 points a game. Take the Spartans to cover.